Whenever we end up travelling east on the 401 one thing always happens: we absolutely MUST stop at the Big Apple. Either we are on a long trip to Montreal or we have an epic weekend of camping ahead, regardless, that giant red apple on the horizon is cause for excitement. Then a cidery opened up inside it. 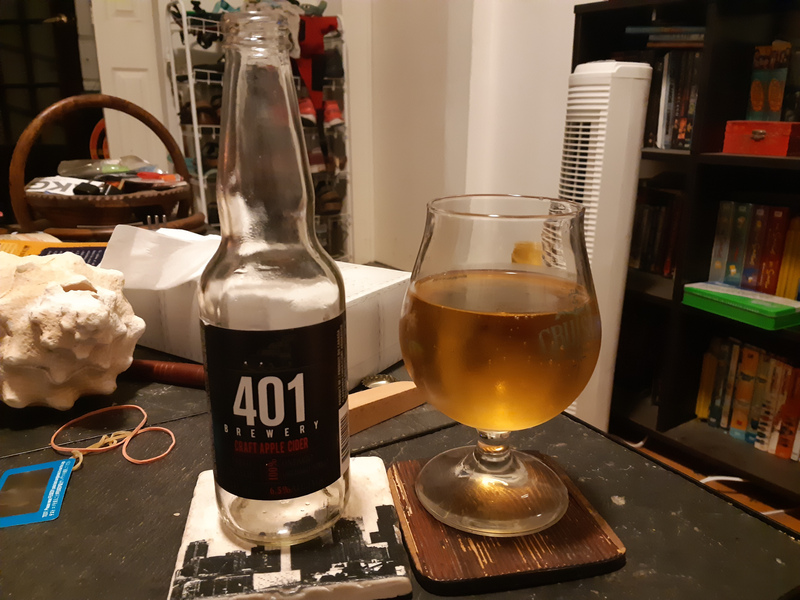 That cidery is called 401 Brewery and it’s the subject of today’s post. They have a wide variety of ciders available including the subject of this review but also including things like pear ciders, black currant ciders and more. I’m going to be honest here – it didn’t dawn on me until writing this review that the name is based on the highway you get off of to get to them. Not sure how I missed that. As mentioned, you can find this brewery inside the Big Apple off of the 401. The bottle pictured above is $3.50 and sits at 6.5% ABV. Appearance: Hay bale gold. No head at all. Filtered. Aroma: Bruised apple first. Red Delicious. Blueberries. Taste: Not as sweet as expected, no more hint of bruise. Very tart and refreshing. High acid. Aftertaste: The bruise comes back in the aftertaste, kind of a caramilk hint as well. Overall: Better than expected but probably bolstered by my love of the big Apple. Have it with a salad. A bit overpriced for the quality.